Yes, its back to the 1980’s again with the Coalition Government, as Deputy Prime Minister Nick Clegg re-heated failed 1980’s policies and youth employment schemes in a desperate attempt to cut youth unemployment now topping 1.6 million. Labour’s Liam Byrne MP rattled Clegg on BBC Radio 4’s Today programme with questions as to where he will get the money to to massage the unemployment figures – £1 billion over three years. Byrne said the idea was a “back to work scheme on the cheap”, and revealed that the government intends to fund the ‘youth contract’ by freezing tax credits for some of the lowest paid. In an interview for Friday’s (November 25th) ‘World Tonight’ on BBC Radio 4 (27 minutes in) I was able to describe government as engaging in a short-term figure-massaging exercise, and that the schemes being proposed were re-hashed YTS and YOP schemes – yet another return to failed Thatcherite schemes such as Enterprise Zones. YTS and YOP schemes were despised by young people as they merely provided a revolving door of cheap and exploited young people who were forced to take short term work in, in the main dead end jobs. What we really need is a system that provides decent training and skilled apprenticeships with a job and qualifications at the end of it – not a merry-go-round of young people moving from one job to another. 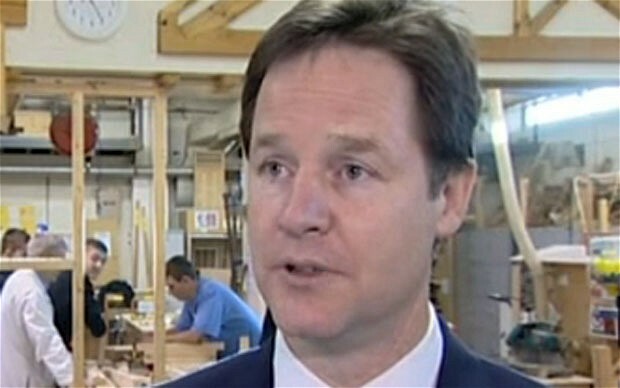 Clegg’s plan smacks of panic and is simply a cosmetic arrangement – a sticking plaster on an open wound. Unite press release – click here. This entry was posted in Blogs, Employment Rights, European Trade Unions, Labour Party, Media, Politics, Trade Unions, Trades Union Congress, Unite The Union, Workers Uniting. Bookmark the permalink.